SINGAPORE—In the end, it was about two men: the leader of the free world, and that of one of the world’s most oppressive regimes. In a handshake, history was made. 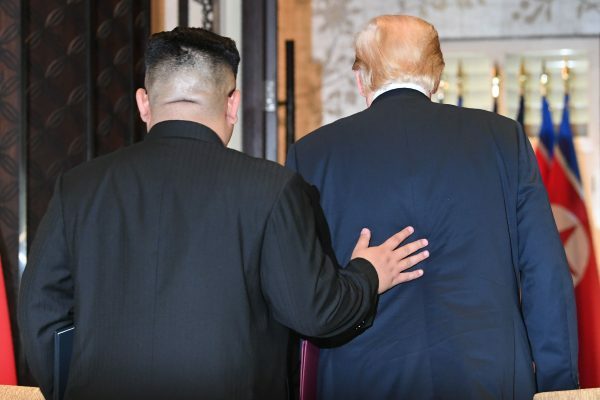 President Donald Trump and North Korean dictator Kim Jong Un showed mutual respect as they met for the first time on June 12, alone but in the world’s spotlight. The two leaders spent about five hours together during a one-on-one meeting, an expanded bilateral, a working lunch, and a signing ceremony, giving a sprinkling of quotes in between to feed the world’s media. 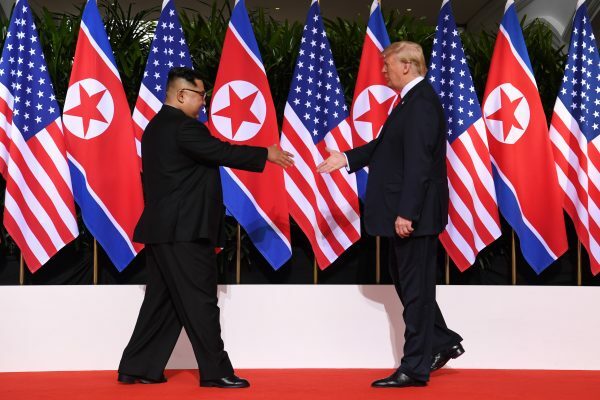 Kim said he wanted to express his gratitude to Trump for making the meeting happen. The summit culminated in the signing of a joint statement that outlined each leader’s commitment to action. 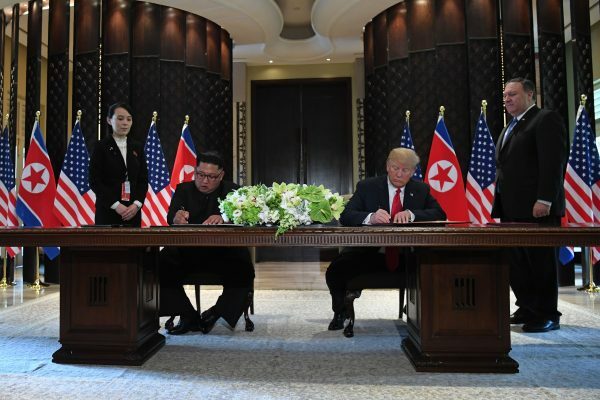 “President Trump committed to provide security guarantees to the DPRK, and Chairman Kim Jong Un reaffirmed his firm and unwavering commitment to complete denuclearization of the Korean Peninsula,” the joint statement reads. Four main points—two broad and two specific—outline the desire for “peace and prosperity” as well as an “unwavering commitment” to denuclearize the Korean Peninsula. North Korea also pledged to return the remains of American soldiers it has held onto since the Korean War. “Today, we had a historic meeting and decided to leave the past behind, and we are about to make a historic change,” he said. Hundreds of media scrambled onto buses in the muggy heat to get to Sentosa Island for a 4 p.m. press conference. Before Trump took the stage in a large auditorium in Capella Hotel, a video produced by the United States blasted from the big screens. It outlined the two futures North Korea could have, depending on the decisions it makes now. Trump said he showed it to Kim and his aides near the end of the summit. “I thought they were fascinated,” Trump said. Reporters asked Trump if meeting with Kim gives the latter legitimacy and puts them on equal footing. “If I can save millions of lives by coming here, sitting down, and establishing a relationship with someone who’s a very powerful man, who’s got firm control of a country, and that country has very powerful nuclear weapons, it’s my honor to do it,” Trump said. He said both rhetoric and sanctions over the last year were important in moving North Korea toward the negotiating table. Ahead of the summit, North Korea released three American hostages and destroyed one of its nuclear test sites. Trump said Kim has a “very substantial arsenal,” but is committed to denuclearization. The process may take as long as 15 years, but Trump said it will be completed as quickly as it can mechanically and physically be done. Kim has agreed to halt all missile and nuclear tests—which he has done for the last seven months. He also agreed to close the primary nuclear test site and to destroy a missile engine testing site. For now, the current sanctions will remain in place. “The sanctions will come off when we are sure that the nukes are no longer a factor,” Trump said. He said the verification process will be carried out by a combination of personnel from the United States and the international community. In return, the United States is giving North Korea security assurances. As a first step, Trump said the “war games”—the military exercises that the United States holds with South Korea—are “provocative” and will be canceled. 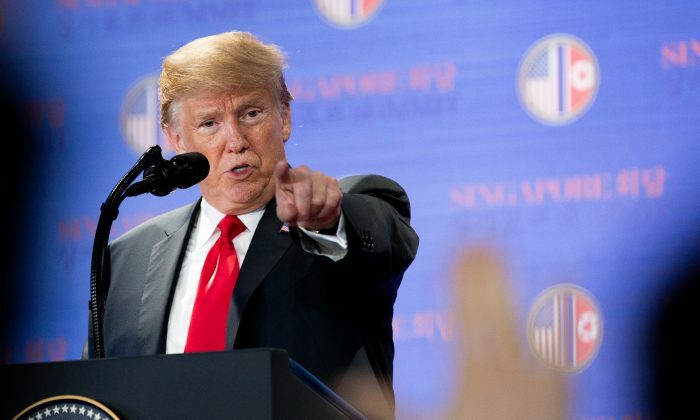 “Under the circumstances that we are negotiating a very comprehensive, complete deal, I think it’s inappropriate to be having war games,” Trump said. On human rights, Trump said he did bring up the topic, although the conversation was brief compared to the talks on denuclearization. The president said he believes the summit would not have happened had it not been for the tragic death of American tourist Otto Warmbier. 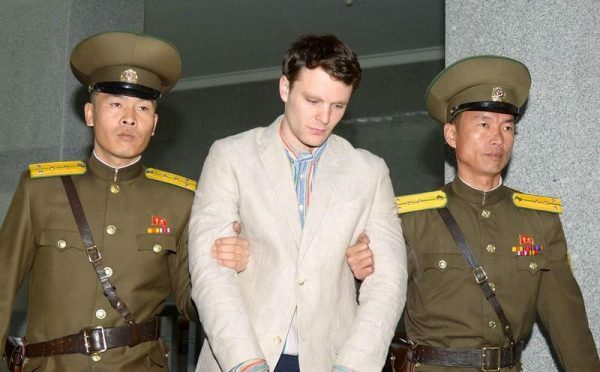 Trump invited Warmbier’s family to his State of the Union address earlier this year, as well as Ji Seong Ho, a North Korean defector who was starved and tortured before escaping. The president has used multiple platforms to bring North Korean human rights to the fore, and has said he believes meeting Kim will ultimately help the approximately 100,000 North Koreans languishing in the nation’s gulags. Trump said he trusts Kim and expressed optimism that Kim will follow through on his commitments—primarily denuclearization. Trump said he has confidence that his administration will succeed where others have failed. Now, Trump said, it’s a different administration, with a different president and secretary of state. Trump said next week he will meet with Pompeo and national security adviser John Bolton and their teams to go over details of the next steps. The president said he would visit Pyongyang “at the appropriate time” and will invite Kim to the White House. 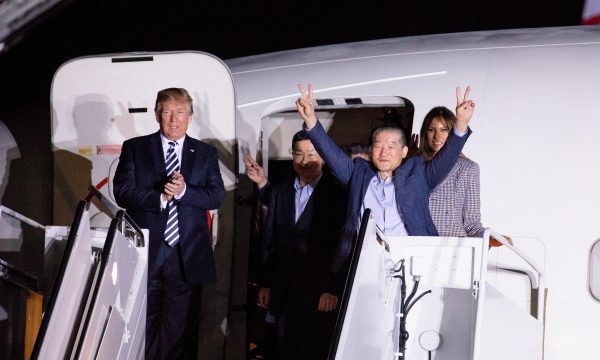 Trump departed Singapore in the early evening of June 12.